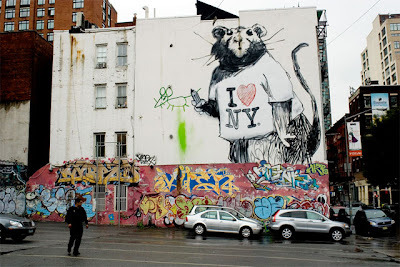 Ananka's Diary: Banksy in New York! Anonymous graffiti artist, Banksy, has left his mark on the streets of New York. For all of you who live here, the mural can be seen at the intersections of Grand and Wooster Streets! Unfortunately, I'm going to NJ today. But I'll stop by if I can! Ohhhh Myyyy God! I LOVE Banksy why can't he be in SF? I bet people in SF wouldn't even care! Everyone here loves stuff like that! Some of the people on that website were like "thats not bansky" well i'm obsessed with bansky and it definitly is, the person just hadn't ever seen bansky's new rat collection. Cool. It's like the giant squirrels. That's awesome! It's reminds me of Kaspar! I have 2 rats and they r da bomb! I can't see why ( except in the case of underground cities) someone wud be offended by one!?! Gooooooo Banksy! !